Instead of adding additional components to a Subaru Model Vehicle to create greater stability & control, Subaru Engineers design their vehicles so that every component works in tandem with each other. Balance and an even distribution of power to all wheels is key for maximum traction, that's why All Subaru Models come equipped with the Subaru Symmetrical AWD standard (except the new BRZ Sports Coupe). The Subaru AWD provides a seamless transfer of power to all four wheels due to its unique connection to the vehicle's boxer engine, and the low profile positioning of the engine that is mounted in-line with the drivetrain. Due to the fact that every Subaru model vehicle has nearly equal weight from side to side, more balance and control is provided while driving and helps the Subaru's AWD system operate at the highest possible efficiency. Subaru Symmetrical All Wheel Drive flows power continuously to all four wheels, and the second you hit a wet or slick part of the road, the system reacts instantly to avoid wheel slippage by shifting power to only the wheels that aren't slipping for maximum traction & control while passing through the hazard. 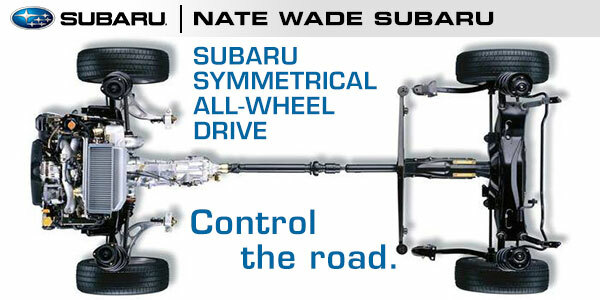 Visit Nate Wade Subaru today to receive complete details & information on the Subaru Symmetrical AWD System.